Born: 10th November 1884, Ipswich. 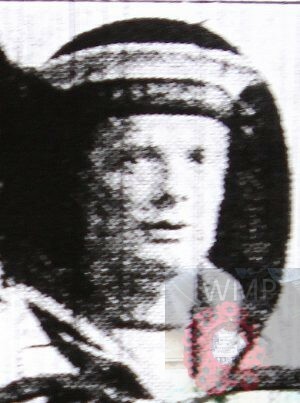 Died: 24th April 1916; age 31; died at sea. Residence: 61, Cavendish Street, Ipswich. Regiment: Royal Naval Reserve, H.M.Trawler ‘Lena Melling’. Relatives Notified & Address: Son of George & Lydia Cotton, of 120, Cavendish Street, Ipswich; husband of Adelaide Cotton, of 61, Cavendish Street, Ipswich. 1891 2, Burton’s Yard, College Street, Ipswich. George Cotton, 32, a Grocer’s Carter, born Aldeburgh, Suffolk. Lydia Cotton (nee Crane), 29, born Ipswich. William George Cotton, 10, born Ipswich. Gertrude Sarah Cotton, 2, born Ipswich. 1901 50, Wykes Bishop Street, Ipswich. Charles was 17 years old, a Seaman. He was living with his parents & siblings. George, 43, a Waterman – Rivers – Barge. Ellen Beatrice Cotton, 9 born Ipswich. Ernest Cotton, 8, born Ipswich. Leslie Cotton, 3, born Ipswich. 1911 61, Cavendish Street, Ipswich. Charles was 27 years old, a Dock Labourer. He was married and Head of the Household. Wilfred Charles W. Cotton, born September 1906, Ipswich. Leonard Percy Cotton, April 1909, Ipswich. IPSWICH MAN KILLED AT SEA. 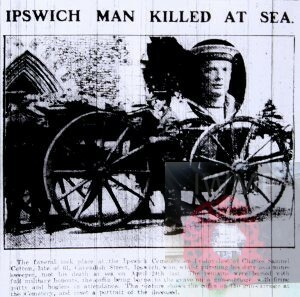 The funeral took place at the Ipswich Cemetery on Friday last of Charles Samuel Cotton, late of 61, Cavendish Street, Ipswich, who, whilst pursuing his duty as a minesweeper, met his death at sea on April 24th last. The remains were buried with full military honours, the coffin being borne to the grave on a gun-carriage, with firing party and buglers in attendance. The picture shows the coffin on the gun-carriage at the Cemetery, and inset a portrait of the deceased. The minesweeper H.M. Trawler was sunk by a mine near the ‘Elbow’ Light Buoy, near Broadstairs, Kent. The mine was laid by UC-7, (Georg Haag). 11 persons were lost, 3 survivors. Charles is also remembered on Holy Trinity church Memorial Ipswich. My father was Arthur George Cotton and he lived in Cavendish Street and was also a seaman, I wonder if they are related. I think they are related to us because the census, the location and the names do match up. Hi Michelle, we are connected to the Cottons in Cavendish Street, what is your connection. I’m assuming your not our Michelle S Cotton. Hi, I am linked to your family because Ellen Beatrice, daughter of Georgevand Lydia, is my paternal grandmother. I would be very grateful for any information and/or photos to help with my research. For some unknown reason when my grandmother died in 1921 she was buried in an unmarked grave and she was never mentioned within family circles.